Physics of Giant Magnetostriction. Modelling of Giant Magnetostrictive Materials. Magnetostrictive Design. Magnetostrictive Material and Actuator Characterization. Device Application Examples. Giant Magnetostrictive Thin Film Technologies. Handbook of Giant Magnetostrictive Materials contains the knowledge that a mechanical or an electrical engineer needs when considering the use of magnetostrictive materials in a construction project. The book covers the physical origin of giant magnetostriction, its manufacturing and metallurgy, and grain related processes under operation. Comprehensive descriptions of useful models of design methods and tools are given, including the performance of devices and systems comprised of magnetostrictive materials, considering the electrical, magnetic, mechanical, and thermal effects. 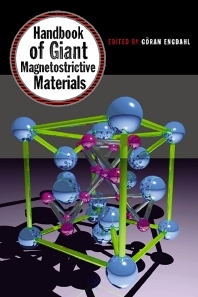 The book covers all major characterization methods of giant magnetostrictive bulk materials, actuators, and systems. A structured inventory of current and emerging applications of giant magnetostrictive materials is given, covering areas such as sound and vibration sources, vibration control, motional control, material processing, and electromechanical converters. The final chapter offers an up-to-date review of the emerging giant magnetostrictive thin film technologies. The book also contains a market inventory with valuable contact information. Materials scientists, electrical engineers, and mechanical engineers. Göran Engdahl received an M.S. degree in 1974 at Teknikum, Uppsala University, Sweden and a Ph.D. degree in 1981 at Uppsala University in Theory of Electricity. He worked from 1980-1983 at the National Defense Research Institute as the first researcher in the field of electromagnetic wave propagation. Active as a project manager at ABB Corporate Research, during 1983-96, he worked with electrical coupling devices and was responsible for a number of development projects on giant magnetostrictive materials. Dr. Engdahl has more than twenty patents for inventions within electrical engineering and hydraulics. Since 1993, he has been an associate professor in the department of electric power engineering, KTH, Stockholm. Since 1987, he has built up a magnetics group at KTH concerned with the characterization and modeling of magnetic and magnetostrictive materials. The group has made significant contributions to the state-of-the-art in dynamic simulation of magnetostrictive systems comprising hysteresis effects.